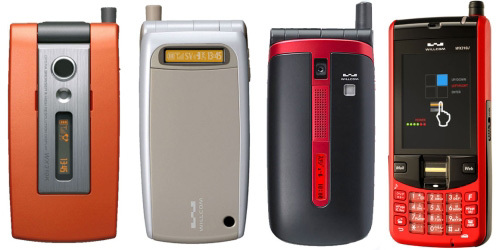 The thing about PHS, or Personal Handy-phone System, is that it suffers a bit of an image problem compared to the likes of au and DoCoMo, as it was the first mobile phone standard in Japan way back in 1989 and has retained an 80s feel of poor coverage and call quality. Willcom changed that perception somewhat with its move to eat-all-you-can datacards using the network and is now clawing back cellphone market share with flat-rate tariffs. The new handsets appear to have finally caught up with the times and include, amongst other things, fingerprint scanners, Bluetooth and USB modems.